John F. Peto: Island Heights’ trompe l’oeil painter. John Frederick Peto, a 19th-century still life painter, never had a single exhibit in his lifetime. He lived quietly, he made quiet paintings and, when he died in 1907, the art world took little notice. Ironically, Peto’s obscurity has made him more accessible to art lovers today. A famous cosmopolitan painter might have traveled and lived in multiple places. He might have shed old possessions, bought new furniture and better art materials. But Peto stayed put in the Victorian house he built, as did his family and descendants. They occupied the house for almost 100 years, preserving Peto’s things, including furniture and dozens of still life objects. Today, these possessions form the core of the John F. Peto Studio Museum in the shore town of Island Heights, Ocean County, New Jersey. It’s been an unlikely journey. Up until 2002, the house was still being run as a bed-and-breakfast by Peto’s granddaughter, Joy Peto Smiley. By that time, however, the art world had discovered Peto. Museums were acquiring his work, and the National Gallery in Washington had given his work a show in 1980. Still, the house might have fallen to the wrecking ball without the help of local philanthropists Peter R. and Cynthia K. Kellogg, whose foundation bought the property in 2005 and spent two years and $2 million to restore it. (The Kelloggs have a summer home in nearby Mantoloking, NJ.) It opened to the public in 2011.
Who was John Frederick Peto? He was born in 1854 to an old Philadelphia family. He studied at the Pennsylvania Academy of Arts, where he met the slightly older artist William Harnett. At the time, landscape painting was the dominant mode of art in America. But Harnett had begun working in the trompe l’oeil style of still life. Trompe l’oeil, French for “fool the eye,” has been around in various forms for a very long time. The approach of Harnett, Peto and others was to paint an array of things (the flatter the better) that were hanging on a wall or door. This way, the painter had only to deal with a very shallow space, which made it possible to create a convincing illusion undisturbed by a viewer looking from different angles. A popular device was the “letter rack,” a kind of bulletin-board effect in which strips of ribbon appear tacked to a wall. Various things are tucked into the ribbons: photos, envelopes, postcards, handbills, news clippings—even entire notebooks or folded newspapers. The illusion of depth is reinforced with careful attention to cast shadows and by making it appear that things overlap. Trompe l’oeil was a populist style with commercial appeal. It wasn’t necessary to go through galleries or museums. Letter rack paintings could be sold to business offices. Paintings with manly themes—mounted guns, dangling game animals, tankards and horseshoes—were sold to saloons and men’s clubs. The Metropolitan Museum of Art currently displays three trompe l’oeil paintings from this period. At the center of the group is one by Harnett, who, then and now, is the star of the school. 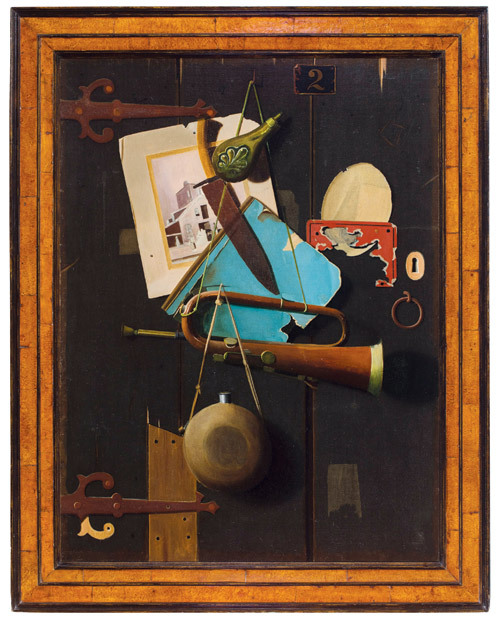 His painting of a violin, some sheet music and other objects hanging on a slightly ajar wood door is the most daring of the three works because of the three-dimensionality of the violin. It is also the most formally composed with the violin at center in a balanced composition. In comparison, Peto’s Old Souvenirs, is meant to look haphazard—an accumulation of things over time. The little girl in a photograph is Peto’s seven-year-old daughter, Helen. This is one of the details that helped prove Peto’s authorship to scholars—to this day the painting bears the signature “Harnett.” No one knows who put it there. It could have been Peto himself or a subsequent buyer looking to boost its market value. The third painter, John Haberle, was the joker of the style. A Bachelor’s Drawer depicts an array of things testifying to the life and interests of the unmarried artist: naughty pin-up photos, political cartoons, playing cards and a tiny newspaper clipping about Haberle himself. As the story goes, Harnett invited Peto to come with him to Europe in 1880, but the less-adventurous Peto declined. In 1889, he moved to Island Heights, located at the bend where the Toms River joins Barnegat Bay. At the time it was a Methodist camp-meeting community. The lure, in addition to the lovely seashore light, was a job as a cornet player with the church band. Peto built a six-room shingle-style house to which he later added a studio and another bedroom. There, he settled into deep domesticity with his wife, daughter and three maternal aunts, selling paintings at the train station and at a town store. The house, now restored in every possible detail, has a quirky look and feel. Curator Harry Bower, a retired art teacher and Island Heights, NJ resident, points out that the house’s cupola and gables form a cluster of three triangles or pyramids, possibly symbols that reflect Peto’s membership in the Freemasons. It’s a structure of crowded volumes and spatial oddities. The upstairs bedrooms are organized diagonally across from each other, perhaps something else to do with Masonic symbolism, or just the artist being playful. These rooms are where the museum’s temporary exhibitions are held. As to why more paintings weren’t kept in the family, one need look no farther than an upstairs bedroom where Peto had painted a trompe l’oeil bookshelf along an upper wall. Over the years, plaster sections of this mural, with its stacked and leaning books, were cannibalized and sold off. One of these fragments was recovered and now hangs in his studio. The other still life paintings in this room are not trompe l’oeil. They are small pictures, set, like traditional still lifes, on tabletops. They are poetic meditations on simple objects—a pipe and jug, some bananas and other fruits. The objects have soft edges and are bathed in a warm, golden light against a dark background, like Old Master paintings. There’s a sweet sadness in these pictures. They share that mood with certain of Peto’s letter-rack pictures, ones in which the objects are beat up and the posted papers have been torn down or simply fallen away. Perhaps had he been more successful, Peto would have painted those lively hunting or drinking pictures for the saloons, as Harnett did. If so, we would have been deprived of this other vision, that of the artist who keeps still and more keenly feels time’s passing and loss. Columnist John Zeaman is a freelance art critic who writes regularly for The Record and Star Ledger newspapers. His reviews of exhibits in New Jersey have garnered awards from the New Jersey Press Association, the Society of Professional Journalists (New Jersey chapter) and the Manhattan-based Society of Silurians, the nation’s oldest press club. He is the author of Dog Walks Man (Lyons Press, September 2010) about art, landscape and dog walking. John F. Peto Studio Museum | 102 Cedar Avenue, Island Heights.